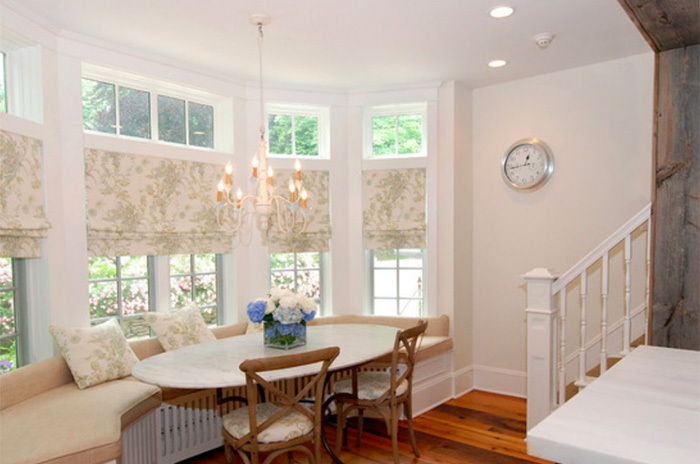 Window Treatments for transom windows are truly one of the most challenging types of windows I come across. Why? It’s not what you think. 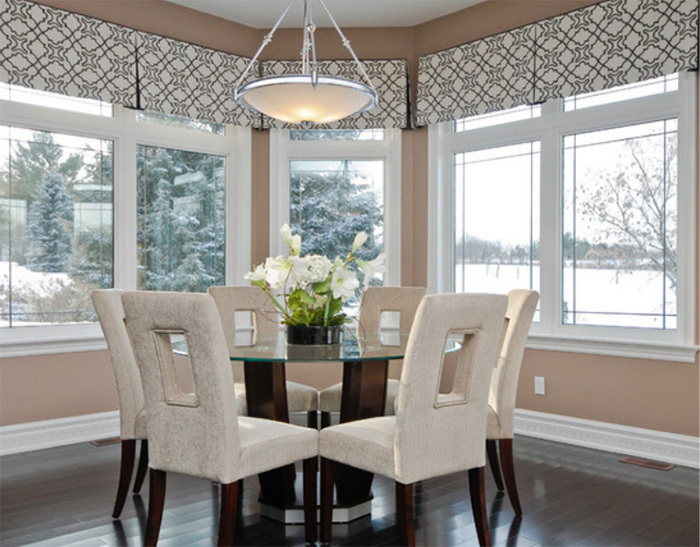 It is not because they all that hard to design window treatments for. 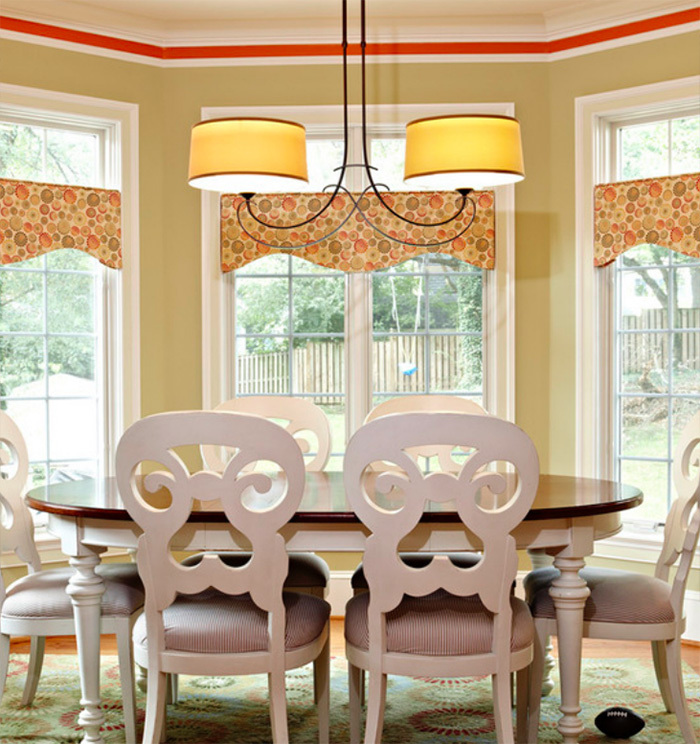 It’s because I find most homeowners have this little voice in their head telling them the window treatments…“must be placed between the transom window and the lower window”. 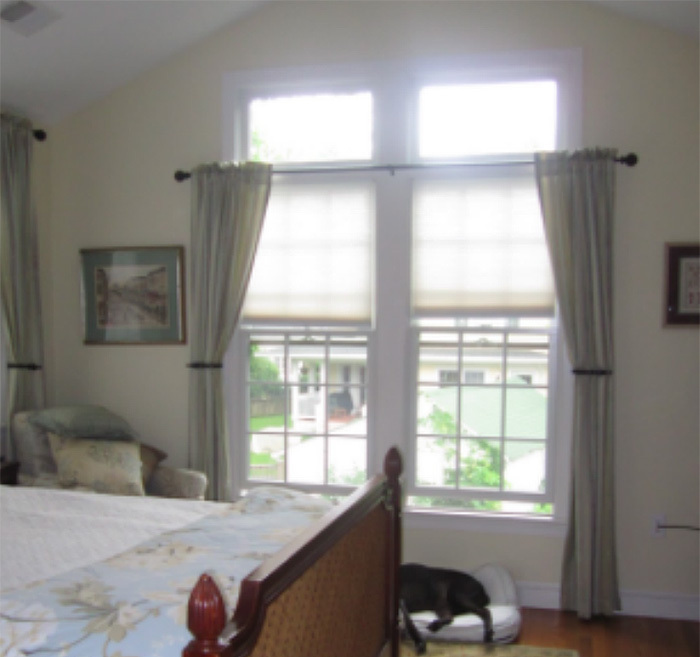 I’m not sure why people get emotionally attached to the top windows….I mean when there isn’t a transom window it is easily understood by everyone that the treatment wouldn’t go anywhere but above the top section of any window. So why is it when there is a transom window the inclination is so prevalent to divide the windows and place the treatments between them? 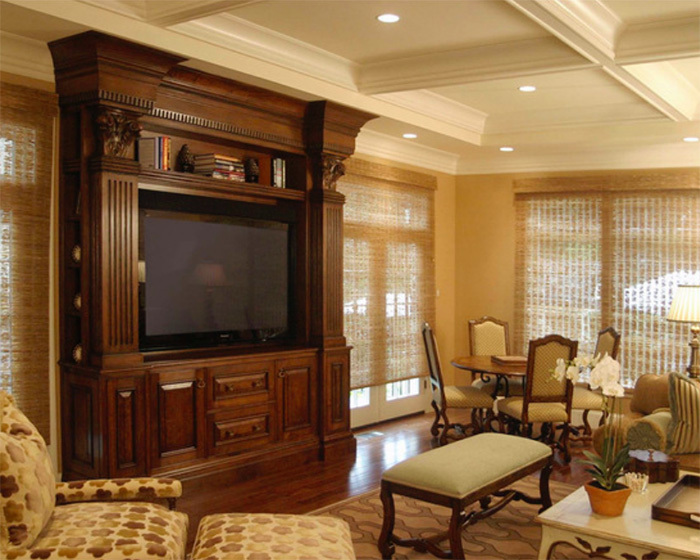 Because of a sliver of molding or a small section of wall….? I don’t know, call me crazy but which looks better to you? The above room designed by: Kiya Developments Ltd.
I’m so used to it by now, so I tread lightly when I first start suggesting ideas. 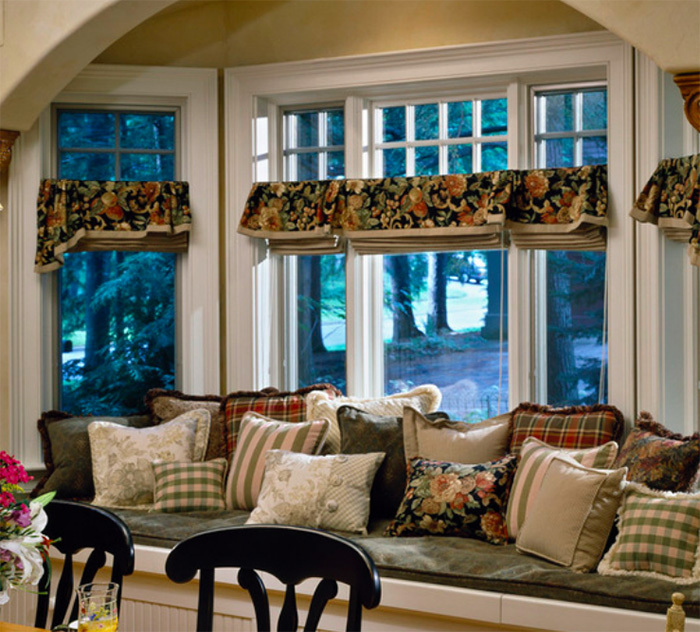 However sometimes I do meet a customer like Sharon S. in Madison, NJ who was happy to listen to new ideas right off the bat and to at least explore the idea of not dividing the windows. She has become one of my favorite customers not only because she is always open to new ideas in window design but because she is just so darn fun and pleasant to work with. I enjoy our visits immensely and have always been proud of the work we have created together. The only thing different is the window treatment and 1 chair in the left corner. Otherwise, same lovely room, same gorgeous area rug, the same tasteful accessories. 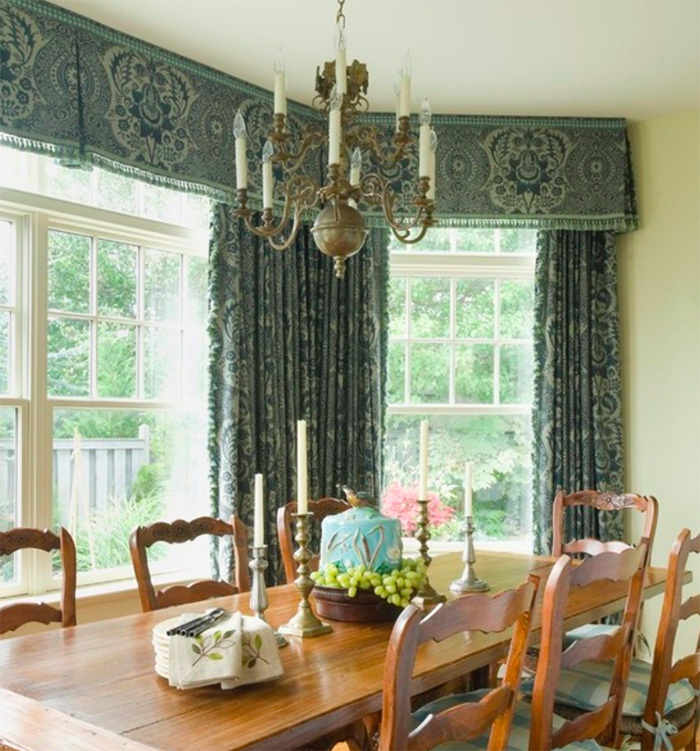 By placing the drapery rod above the transom window we accomplish two things, we draw the eye up and we create a sort of lightweight valance effect. As a bonus, the rods visually connect the two windows to each other. The drapery panels, placed on the outsides only, anchor the room and create a compelling focal point, immediately grabbing your attention when entering the room. And lastly, what else do you also notice? Yes!! The light still streams in washing over the room, the view outdoors invites you to look further and rather than detracting from the room design by working above the transom, the room actually springs to life! 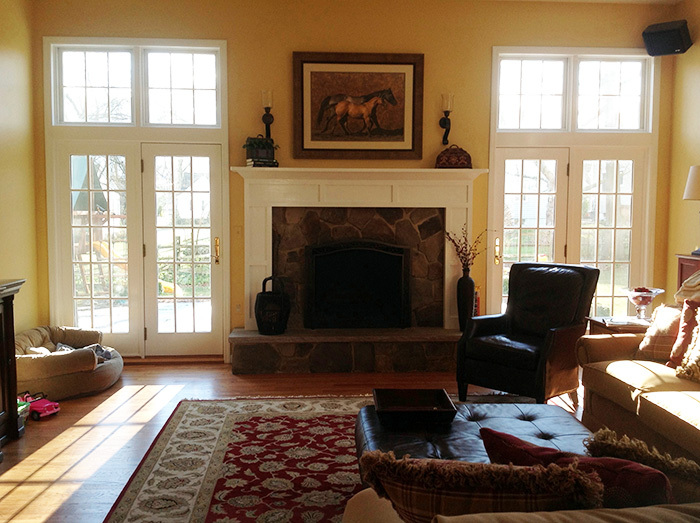 Email me, let me know what you think or let me know if you have some tricky transom windows that need some help. 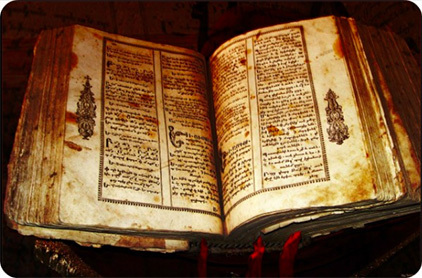 And please, let me know if you have seen that pesky book telling everyone to divide the transom windows! 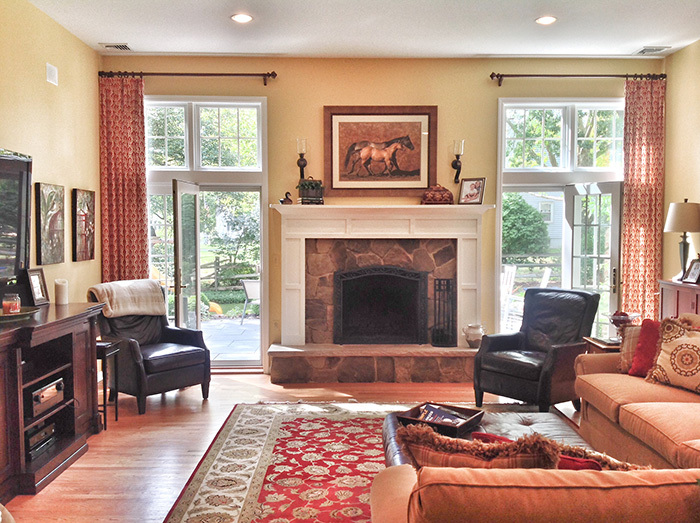 Hi , we moved into a ranch style house that has 3 transom windows and casement style ! 2 flank the fireplace in family room and one is next to other on opposite wall. House is very hot with sun beating in all day it’s like a greenhouse . This is not our forever home so we don’t want to spend a lot . I want it to look nice . Hubby wants it to cool down . What are our options ? I could send pics if you want . 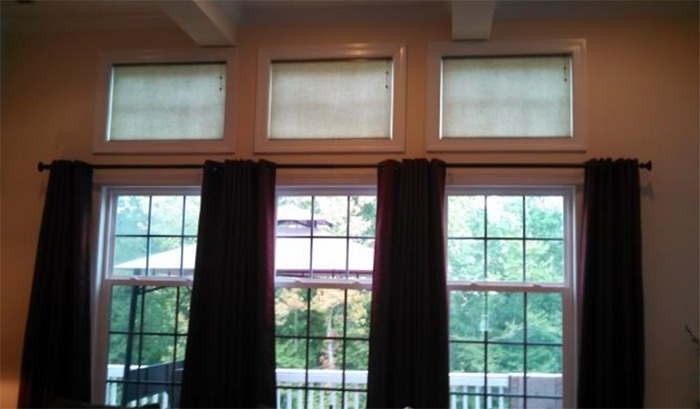 Shades that are custom are not something I want to spend in this house . Sounds like a challenging situation… yes, please email pics to us at info@windowworksnj.com and I’ll see if I can make some suggestions for you. We have curved transon windows for which I’d like to provide a covering….which is adjustable, or not. I’d need to see your curved transom windows in order to make a helpful suggestion. Are you located in northern nj? We have a free shop at home service that we can set up fir you. My builder won’t add the transom windows to the living room because he said it’s too late because windows have been ordered and they’re in production, can I add transom windows after the house it built and finished? If so, how much would that cost approximately? is it worth it?